Nice and clean hotel. Staff is very polite and helpful. 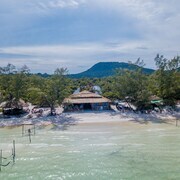 I’m reviewing this solely on the property and it’s small section of the beach and not the surrounding area of Sihanoukville which is as horrific as everyone says. We stayed here for a night either side of our visit to the islands. We recommend this as it took away the stress of delayed ferry/ missing flight scenario and was a lovely place to chill. It also meant we could leave most of our luggage and just take a small rucksack each. This proved perfect for us as we needed very little clothing and could traverse the island to stay at Sundet beach easily. When we returned the lovely man at reception had arranged for our luggage to be waiting for us in our room. He also arranged for a taxi to be at the airport when we arrived (with an agreed price). We also booked ferry to the island through them at no extra cost and free pick up from ferry company. It made life very hassle free. The restaurant was great, the cocktails and happy hours well received. 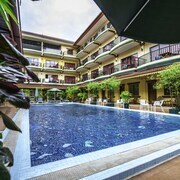 The sun beds plentiful and the pool pleasant in a tropical setting. Included breakfast and welcome drink were also lovely. Khám phá Đảo Bamboo với Cẩm nang du lịch của Expedia.com.vn để tìm chuyến bay, xe, gói kỳ nghỉ tốt nhất và nhiều hơn nữa!